Walmart has added a classified listings service to their site. Silicon Valley startup Oodle, which was founded in 2004, is powering the service. The listings are free, which means Walmart is likely doing the deal to generate page views and advertising impressions. They also now compete with both Craigslist and eBay-owned Kijiji. Walmart has a mixed history of success with Web businesses, but Walmart.com attracts 26 million visitors a month in the.U.S., according to comScore. Amazon attracts 47 million. The classifieds listing’s went up quietly last week on Walmart’s site. 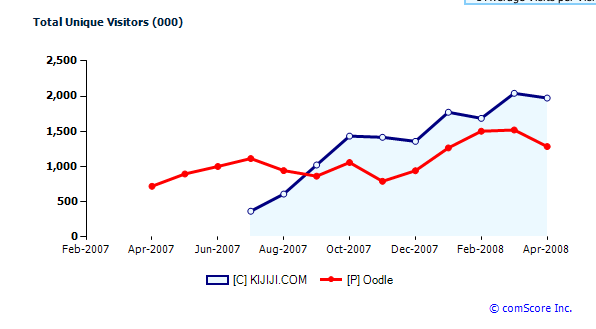 The deal should help Oodle compeet against eBay’s Kijiji, which recently passed it in in the U.S., with 2 million unique visitors in April, versus 1.3 million for Oodle. Both trail way behind Craigslist, which has 30 million uniques, and is currently embroiled in a nasty lawsuit with eBay over Kijiji’s market entry into the U.S.